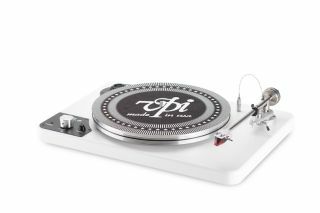 VPI introduces new all-in-one turntable with headphone amp | What Hi-Fi? No speakers required to play your records on this 'affordable high-end' turntable. The Player is the latest turntable to be produced by New Jersey-based brand VPI. Featuring a built-in phono stage, and a headphone amplifier with its own volume control, it is being labelled a truly plug ’n’ play deck, similar to the VPI Nomad. There’s a headphone output onboard, in this instance a 3.5mm jack, but the Player can also be hooked up to your hi-fi system like any other turntable, and the integrated phono stage bypassed in favour of an external one. The Player comes complete with an Ortofon 2M Red phono cartridge on a 9in metal gimballed tonearm, mounted on an aluminum platter which, along with the arm and feet, is upgradeable. While VPI’s catalogue isn’t short of high-end decks, including the Award-winning VPI Prime, we weren’t bowled over by the build quality of its 'high-end entry-level' Nomad (£795).